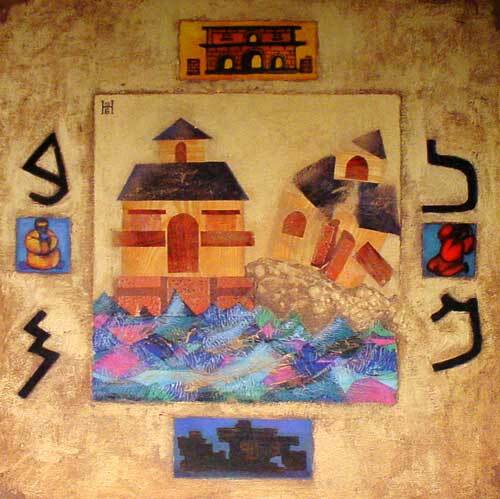 "Two House Builders" by Kazakhstan Artist Nelly Bube. Earlier in this series, Epiphany IV-VII, we had four texts from the beginning of Jesus' Sermon on the Mount. The false teachers of Jesus' day were teaching a mechanical, external moralism. Throughout the Sermon on the Mount Jesus stresses the true righteousness of life which proceeds from a penitent, believing heart which knows that it is accounted righteous for Jesus' sake. Matthew 7:15-20, the verses previous to the text for today, is a warning about false prophets. They are wolves in sheep's clothing. They are dead trees which produce worthless fruits. In verse 20 Jesus says: "Therefore, from their fruits; you will recognize them." Their fruits are their false doctrines. They teach the commandments of men instead of the doctrines of God. Christians have the God-given ability to distinguish between true and false teachers. Our text for today should be understood with this in mind. Matthew 7:21 "Not everyone who says to me, 'Lord, Lord,' will enter the kingdom of heaven, but only he who does the will of my Father who is in heaven. Many, in this life, say "Lord, Lord!" But that, in itself, is no assurance that they are on the way to everlasting life. Some are on the true way. But Paul says in 1 Corinthians 12:3: "No one can say 'Jesus is Lord' except by the Holy Spirit." Jesus is saying: "Do not be deceived by the mere and frequent use of my name." Even the deceiver is constant in saying "Lord, Lord." The papacy is a prime example. Charismatics speak so glowingly about the Lord. Remember Jesus' warning at Matthew 24:5. Deceivers even claim to be the Christ. Test them by their teachings. "But" means "quite to the contrary." Then follows "He who is constantly doing the will of My Father Who is in heaven." Note the variant reading which adds: "he will enter into the kingdom of heaven." Though an inferior reading, these words are implicit in verse 21. Read 1 Corinthians 9:27. Even the Apostle did not delude himself. Read 1 Corinthians 13:1.2, a warning to all of us. Note that Jesus calls the Father MY Father, thus clearly showing His divinity. "In heaven" is adjectival, telling us what kind of Father He is, not adverbial, telling us where He is. What is the will of Jesus' Father? Read John 6:29.30.40. God works faith in Jesus in me. He wills that the person whom He has given to Jesus will never be lost. God wills that man repent of his sins and believe in Christ, Matthew 3:12, and that such believers let their light shine before men, Matthew 5:16. All this is involved in doing the will of Jesus' Father. It is not optional. This verse tells us what will happen on Judgment Day. Many deceivers will speak to Christ. Even before His throne they will keep on saying "Lord, Lord!" Now follow three questions which expect an affirmative answer. They make three claims: prophecy, exorcism and many miracles. Whether "prophesy" here means "foretell" or "forth tell" makes little difference. The point is that they make it something out of the ordinary and their sole boast. At this point read Luke 10:20, and Galatians 6:14. False prophets may, with Satan's help, teach remarkably, cast out demons and perform miracles. But that is no safe criterion. Read Deuteronomy 13:1-3. When a false prophet performs signs which come true, don't follow him but test his words. Fahling: They and their followers may display the greatest piety and religious fervor. Are deeds of charity, even prophecy, the casting out of devils, healing, or some other wonderful works the fruits by which they are to be known? All these are no safe criteria. Fruits of this kind may be the deceptive sheep's clothing of which the Lord has spoken (verses 15-20). From Matthew 25:37-39 we learn that true believers, humble, unassuming Christians, will be surprised when Jesus; commends them on Judgment Day for their works done for Him. From Matthew 7:22 we learn that many false people, who deluded themselves during their lifetime, will still be boasting about their works. Luke 10:20 warns us now so that we might repent of our boasting in works, though they be God pleasing. Ylvisaker: It is significant that those who are rejected invoke their deeds. Those who are saved know nothing of works; they have done good deeds, to be sure, for their faith has ever been active in love, but they are not cognizant of the fact (Matthew 25:35-40). Luther: Many on the final day will appeal to their own prophesying in the name of Jesus, that they drove out devils, did mighty deeds, but the Lord will discard them as evil doers, not acknowledging them as His own. These are false Christians only in name, who disgracefully misuse the Name of Jesus and apparently in Jesus' Name, but actually prophesy and do wonders with the power of the devil. Jesus here warns His disciples against all hypocrites and all hypocrisy. All who call Jesus their Lord must show it by their living, that they with their hearts cling to Jesus their Lord and Savior. Bengel: Although they had not thought so before. This will come as a shock to them. "Plainly" is variously translated: "declare, tell them plainly, tell them to their faces, tell them frankly" in our modern translations. It does not mean "confess." It's a direct quote. "Knew" here used as at John 10:27 and 1 Corinthians 13:12, the saving and intimate knowledge of Savior toward believer. It is not mere omniscience. This means an eternal, saving, gracious knowledge, not mere knowledge that the elect would believe. This one word was the primary point in the controversy between the Missouri and Ohio Synods in the Predestinarian controversy. Missouri said: "God foreknew by a gracious, saving salvation in Christ." Ohio said: "God foreknew that they would believe intuitu fidei and therefore elected them because they would believe." Now Jesus quotes Psalm 6:8. "Away" is a strong imperative. It reminds one of 2 Thessalonians 1:9. For such the mercy and grace of God are forever ended. "Evildoers" is "you who are still working ." Bengel: Not even then will their iniquity have been changed. Lenski: The present participle indicates constant character. The word "evildoers" in the New Testament makes an interesting study. We note a few of the passages. At 1 John 3:4 we read: "Sin is lawlessness. "(Read it in Greek. Subject and predicate both have articles and therefore are interchangeable.) All men are guilty of sin and lawlessness. At Hebrews 10:17 we read: "Their sin and their lawlessness I will no longer remember." According to verse 18 this means what Christ did for all men. But, if men persist in impenitence, refuse the Gospel, then they are accountable for their "evildoing." Look at 2 Thessalonians 2:3.7. The Antichrist is called "the man of lawlessness, the son of destruction." He deliberately perverts God's message and leads people to destruction. Here in Matthew 7:23 the deluded hypocrites are called "workers of lawlessness." Jesus sees nothing but sin in them. Verses 24-27 are parabolic. "In view of what I've said in verses 15-23." However, some think it goes way back to 5:1, the beginning of the sermon, covering the entire sermon. On this verse compare Luke 8:15 and 21 and also James 1:25. Hearing and doing stand or fall together. "Blessed are they who hear the Word of God and keep it." Luke 11:28. Dogmatically stated this means: contrition caused by the second use of the Law, faith in Christ caused by the Gospel, and the resultant Christian living in keeping with the third use of the Law. By saying "these words of mine" Jesus clearly implies that He is true God. No mere man could say this. "Puts them into practice" is actually future because the likeness will become apparent on Judgment Day. Men may not see it now but they will on that day. Compare Matthew 25:31-40. If you are unsung now, worry not. God knows and notes and will not forget. Compare Luke 14:14. Just be faithful unto death. He will give the crown, though not earned. "Wise" is variously translated "wise, sensible, had the sense to." To build a house on a foundation of rock is just plain, common sense. When you buy a house, not only are you concerned about its beauty but also about its foundation. A faulty foundation destroys construction. A fierce testing of the house. Lutheran commentators are agreed that this denotes the final great test, death itself. Note that both in verse 24 and 26 the words "hears and puts" are used. Those who hear the Word of God are in one of two classes, none in between. They either do them or do them not. Read James 1:22. Much of James is devoted to deluded Christians, those who hear but do not do. Luther: All who call Jesus their Lord must show it by their living that they with their hearts cling to Jesus their Lord and Savior. . . . It is not his acts and obedience that make him firm and steadfast, but with such doing he proves that he is grounded in faith, that his faith has taken root, and by his faith is conquering all opposition. . . . He who hears Jesus' words only with the ears, but does not do them, and neglects Christian works, he thereby shows that he has no Christian faith. Faith dies, when the indwelling strength of it is denied. "Foolish" is the opposite of "wise." Who would be so stupid as to build a house on sand? The foundation is simply everything. The house, of course, represents the life which a man leads. The life of a Christian and of a non-Christian may look very similar. But all depends on the foundation. What is the foundation here? Lenski: The rock is God Himself in His Word and his grace, Deuteronomy 32:15.18; Psalm 18:2; Isaiah 17:10; or Christ Himself, Isaiah 28:16; Romans 9:33; 1 Peter 2:6; 1 Corinthians 3:11. Unless grounded in the Word of God and Christ Himself, a man's life is nothing but sin. But if grounded in that Word and in Christ, not even death can destroy what is God-pleasing. Jesus, of course, is not saying that works save or that works make the foundation secure. Good works are "the fruit of the Spirit." Galatians 5:22.23. In that sense they are necessary. Matthew 7:27 The rain came down, the streams rose, and the winds blew and beat against that house, and it fell with a great crash." Disaster! Here, in illustration, Jesus is saying the same thing as He said in verse 23. The fall and collapse is total and final, everlasting destruction. Starkest Law. The first part of this verse clearly states that Matthew had recorded an actual sermon. He did not "compile" a bunch of Jesus' sayings to make it look like a sermon. The teaching continued for some time. What Jesus said is called didachi or teachings. He taught the crowds. Why were they dumbfounded? That is answered in the next verse. Matthew 7:29 because he taught as one who had authority, and not as their teachers of the law. "Because" explains why they were so amazed, so astonished, so dumbfounded. Note the verb which means that He was constantly teaching. "As" does not mean "as if" but "because." Stoeckhardt: He preached God's Word as His very own, and His very own as God's Word. Lenski: The deity of Jesus revealed itself in all that he said. Ylvisaker: The populace was astounded that this Jesus, who was no scholar in the ordinary sense, could speak in this way; but the hearers were also stricken in their conscience by the mighty and solemn discourse which flowed from His lips. He taught with divine power and authority. The preaching of the Apostles had the same effect because they spoke divine words. Every faithful, evangelical preacher's words ought have the same effect on hearers: "He is truly God's spokesman." Then follows: "And not as their scribes (were teaching)." This phrase in our versions is variously translated "their teachers of the Law, their own teachers, their Bible scholars." The text, of course, is not saying that this was so because they were mere humans but that their teaching was like that described in verses 15-20. The prophets and Apostles truly taught God's Word. The teachers in Jesus' day very often taught men's doctrines instead of God's Word. Ylvisaker: They were traditionalists and had no shepherd-love, therefore their testimony became insipid moral vaporing without sap and without strength. Fahling: Here was a teacher with a message of eternal truth. While the professional teachers droned out their traditions and the injunctions of a Law which was in effect dead in their own lives, never as much as by a hair's breadth passing beyond the carefully watched boundary lines of commentary and precedent, here was authoritative preaching; it was the voice of Him who was both God and man in one person. Lenski: To this day it is hard to understand the arid dreariness of the old teaching of the scribes. . . . The 'talks' given in some of the pulpits of today, based on other subjects than the teachings and sayings of Jesus, with little meat for the soul, are the continuation of the deliverances of the Jewish scribes. May that never be said of the person who is reading these notes! Adapted from Exegetical Notes, Series A Matthew-John Sundays After Pentecost Gospel Texts, by Harold H. Buls, Concordia Theological Seminary Press: Ft Wayne IN, 1981, pp. 4-7. Used with permission.